In mid summer, from 15th of July, Arctic Wildlife Tours did a 14 day long Svalbard expedition 2016, sailing with the yacht Arctica II. We were 8 passengers, myself as a travel leader and two skippers and guides. The plan was to sail up along the west coast of Spitsbergen and follow the northern parts of the Island, before we set course down the Hinlopen strait. And we did. We reached all the way from north down to Wahlbergøya and the other small islands in the south end of Hinlopen. We found a lot of Wildlife there. Already counting over 10 Polar Bears. Our skipper, Heinrich Eggenfeller which is born and raised in Svalbard, decided to sail on the east side of Nord-Austlandet towards the north. And so we did. A lot of calving ice from the glazier Austfonna made us sail almost into Russian waters. It was beautiful. A lot of ice, birdlife and some marine mammals as seals. The silence, loneliness and the greatness being out in this wilderness was maybe the greatest feeling of all. The track log from the expedition shows the capacity the sail yacht Arctica II have. With two skippers on board and a positive attitude we do really long distances. We also have time for anchoring and watching wildlife or the scenery. This "Svalbard expedition 2016" lasting 14 days should prove to become one of the best I ever have done. Our first sightings of Polar Bears during the expedition in Liefdefjord. On one of the small islands in Liefdefjorden we found a sleeping female Polar Bear and her cub. They was barely visible up on a warm spot on the island where the warmth from the sun reached the animals. We was watching them for hours from the Arctica II which was anchored near the islands. We used the zodiacs to cruise around in the area and discovered even one more bear on one of the other islands, a much bigger male animal. We was waiting for the animals to do something interesting for photography, but nothing happened. We decided to move on in search of new situations. So far at this moment of the Svalbard expedition 2016 it was already a success. Stopping by Texas Bar, the famous cabin in Van Mijen fjord that the locals in Longyearbyen can use whenever its available, doing some grilling on the shore. Heinrich Eggenfellner dos the grilling. He is familiar with the cabin after many trips there as a younger Svalbardian. He was famous in Longyearbyen after one time he had to scare away a Polar Bear, that was climbing in the window during a night Heinrich was sleeping there after a long snowmobile drive from Longyearbyen, by hitting the bear with a frying pan. Not many people would have the nerves to do that! The cabin Texas Bar is not any luxury. Two small rooms with two beds, one small table and a oven. After a few hours on the shore our expedition had to continue. We set course to the north and planning to sail down the Hinlopen strait. Because of rough sea we stopped by in "Sorgfjorden", the fjord of sorrows, on the northernmost corner of Spitsbergen. We did a landing there when anchoring in shelter of the wind and did some landscape photography on the scenic place far north on Spitsbergen. After "Sorgfjorden" we reached the famous "Alkefjellet", where 400 000 Brünich Guillemots nests during the summer. We had time for some special photography using floating equipments, drysuits and underwater housings mounted on a pole. "Alkefjellet" is an amazing place. After "Alkefjellet" we continued our journey down the Hinlopen and passed the Walrus colony on the southernmost spot of "Wahlbergøya". We stayed there for some hours photographing the Walruses before we sailed around the island, checking out a puffing colony there. We found the puffins first - after that we sailed into the most strange situation I ever have seen in Svalbard. A Polar Bear family eating green gras four hours a day. We anchored there for 48 hours watching and photographing this family. It was a rare sight! The long sailing around Nordaustlandet during the Svalbard expedition 2016 I will always remember as an adventure. The weather was calm with almost no wind. As we set course to the east in the evening the glazier "Austfonna" was our view during many hours. Some birdlife like Ivory Gulls was the only wildlife we did see for a while. On the eastern side of Nordaustlandet we had to make a turn far east to get by a lot of calving ice from the glazier. In the morning we reached "Storøya" situated on the northeast corner of Nordaustlandet. After a short while we discovered that we had found a Polar Bear garden there, 10 Polar Bears was feasting on the remains of a whale carcass. Luckily we had good weather when anchoring by Storøya on shallow water. These areas is not so easy sailing in because of the depth. But with a small yacht like Arctica II it was possible. It was a lot of activity around the carcass, at that time we reached the island it was almost eaten all of it, and we had different situations with the Polar Bears. We spent one night and almost two days in this area. Not far from the Polar Bears we had close encounters with Walruses. Canon 6D, EF 8-15mm fisheye, 1/320 sec, f / 8,0. Underwater housing. "Svalbard expedition 2016" had at this moment lastet 9 days and we was counting nearly 30 Polar bears already. Also lots of birdlife, Walruses and seals was seen during these 9 first days. The only animals we not had seen was any whales. A bit disappointing, because that was something I had expected, but we survived with the result we had. The weather started to change when we left Storøya, heading for Sjuøyane. We had some fog when we passed Karl IV island. 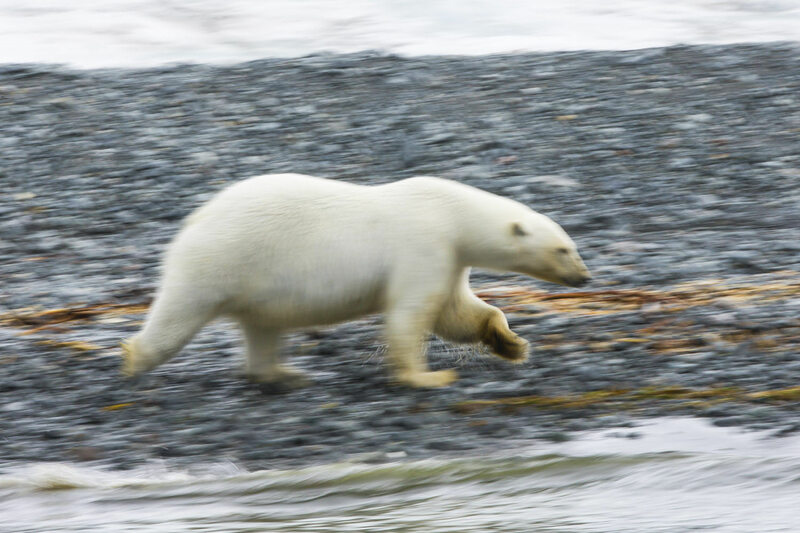 One Polar Bear was spotted on the shores. We continued our "Svalbard expedition 2016" and reached the northernmost island Ross Island, that is one of the islands in the group of Islands Seven Islands. The wind now was considerably increasing. The weather cast forecasted even stronger wind the coming days. In the middle of the night day 11th day we anchored by the Walrus colony in "Isflakbukta". Far away from the shores and the few persons that was awake could barely see the Walruses on land. Suddenly a group of animals started to swim straight towards us. I understood immediately that this could become a interesting situation and prepared the underwater photo equipment before I jumped down in one of the zodiacs. After this experience we rested during the night. The next day would definitely give us some windy conditions and we wanted to do a transport distance back to the northern parts of Spitsbergen. Windy conditions in open sea was nothing for Arctica II. Wind from styrbord side and the main sail up halv way stabilized the yacht and everything was nice. On the west coast of Spitsbergen we had time to search of Kongsfjorden and we did a short hike up to Ocean Sars looking for Arctic Foxes. We found a couple of adult individuals there and got some nice pictures. Otherwise some Reindeers was interesting. After visiting Krossfjorden also we did the last distance back to Isfjorden. A short stop by Alkehornet and after that we prepared the last dinner during this trip. After 14 days we had experienced a lot. Heinrich Eggenfeller invited one of the two last trappers still living in Svalbard, Harald Solheim, on Kapp Wijk where his cabin is situated. It was a very interesting meeting with this man that have livet there for nearly 40 years. Many stories was told during his visit onboard Arctica II.